So, you decided to become a Travel Hacker? Congrats! In order to be a very successful travel hacker, it is important to get organized as soon as possible after beginning. After all, even if you just open one or two credit cards and that is all you ever do, you are still going to have bill due dates, loyalty program numbers, points to track and more. Just imagine all the organization that needs to be done if you start doing multiple credit card rounds and eventually have, say…over 60 credit cards to manage! (Yes, it’s true. Andy and I have opened and managed over 60 cards combined!!! Check out the story in our Managing Credit Cards Case Study: Part II). So, needless to say, we have become experts on learning how to stay organized and on top of the points and travel hacking game. You can really use any sort of spreadsheet, but I love Google’s because I can use it anywhere, on the go, and share between Andy and I easily for us both to track and update. You can geek out as much as you want with spreadsheets and include as much or as little information as you want. 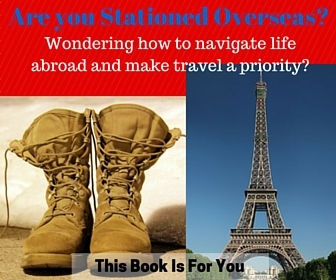 Jackie over at TheGlobeTrottingTeacher also uses spreadsheets. 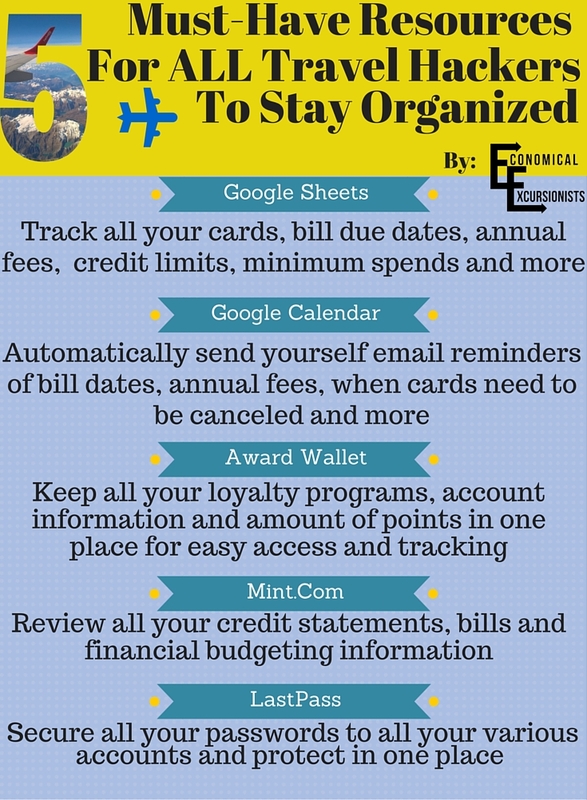 Check out how she utilizes them to stay organized here. For the same reason that I like GoogleSheets, I like GoogleCalender. I can use it on the go, edit from anywhere and share with anyone that the topic of the calendar pertains to. For travel hacking, there are plenty of dates that you’ll need to remember to act on. For example, if there is an annual fee that you don’t want to pay, you’ll have to remember to cancel your card several days before you get hit with the outrageous expense. When you get your card, simply put in a reminder in your calendar to email you shortly before your fee is due. Apply the same email reminder technique with any other bill dates, points expiration dates or really just anything that is in the future but will need action to be taken. AwardWallet is a Travel Hacker’s dream come true for organizing all your points and award/loyalty programs! ✓ Need to quickly remember an account or loyalty program ID number? No problem. ✓ Collect both hotel and airlines miles? Maintain them all in one easy place. ✓ Have multiple family members that collect points and needs tracking? Manage them all with one account. ✓ Forgot when your points expire? (Tsk Tsk…why aren’t you using the previous two resources!?) AwardWallet’s got your back. Part of travel hacking is that above and beyond everything else, you MUST be financially responsible!!! NO ifs, ands or buts! If you can’t manage to pay off each and every monthly credit card statement, you should not be playing this game. Luckily, Mint.com is great for managing all of your finances, whether you are a travel hacker or not. However, you can use it to your travel hacking advantage for sure. You can create different budgets (travel, dining, every day spending, etc.) and track your minimum spending on each credit card. One of my favorite features is that I can review all my statements in one place. Since we have multiple cards open at a time (for example, we currently have 15 open!) I want a quick way to make sure that all the charges look correct or that I’m getting the bonus points deserved for specific spending habits. This resource and tool actually has nothing to do specifically with Travel Hacking. However, we have all been in the same boat where we can’t remember user names and passwords. Just from this resource guide alone, you are looking at potentially 4 separate user names and passwords. I personally don’t feel comfortable just adding these to a column in a spreadsheet because those passwords are extremely important and vulnerable, considering my banking and credit information is tied to some of those accounts! So, your homework today is to go and get yo’ self organized! If you are just beginning, do this immediately so that you aren’t scrambling in the future. If you have been travel hacking for some time, what are your favorite resources to help you stay organized? As you use the sites, it will start to ask you if you want to save. Just simply say yes. I’ve started using their generated passwords though on new sites . Since it tracks it for me, I know they are secure and if anything ever gets hacked, my accounts will all be different (w/out me having to remember every.single.one), so I’m safe! Pingback: Which airmiles credit card is the best in the UK? Whoa! You guys have it sorted. 60 cards at once – I can just about manage myself, let alone 60 pieces of plastic, so I applaud you! I know it clearly pays off and you must be getting some amazing deals. Time for me to pull my socks up and using the resources you’ve listed! Haha…well, we started (semi) slow and I have my husband to thank for being so organized. If it weren’t for him, there is no way I’d have been able to manage all of that! I live by my Google sheets for travel hacking! Only way to keep everything organized and keep me sane :D! I think of these resources as a nice backbone for travel hacking. It’s good to have your affairs in order, so to speak, before you start hacking in a serious way! You have some great advice here. I would be lost without Lastpass. I can’t believe how many people still use poor passwords or use the same password for all of their accounts. I am not the most meticulous planner. When I plan for my travels, I use the notepad on my iPhone! Hah, I think I’ll look into these and get more organized! Love how you organised these sites in a simple summarised chart-super useful! I think I need LastPass, too many accounts, too many password requirements and changes.